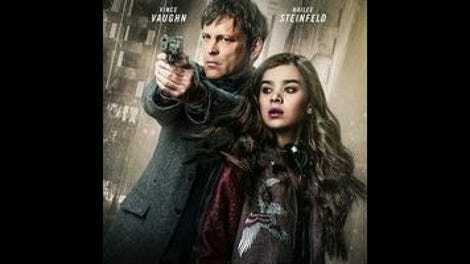 More starch than pulp, Term Life follows a career criminal named Nick (Vince Vaughn, hair combed forward into an indie-rock Moe Howard ’do) as he tries to protect his estranged daughter, Cate (Hailee Steinfeld), from the dirty cops and cartel thugs who are after them. Directed by longtime Vaughn associate Peter Billingsley—still best known as the kid from A Christmas Story—this vapid genre exercise doesn’t have much going for it beyond the over-qualified supporting cast, who are given little to do in roles than rarely amount to more than a couple of scenes. The premise, which pits crooks on both sides of the law against each other in the aftermath of a heist gone wrong, might bring to mind the foul-mouthed Tarantino imitations of yesteryear, but this style-less Take Your Daughter To Work Day release doesn’t even have the personality of a knock-off. Set in an anonymous and de-Southern-ized Atlanta, Term Life introduces Nick as a professional “heist planner” who finds himself on the wrong side of several parties after his latest job ends with the crew dead and the money missing. Actually, the plot is a lot more convoluted than that; it involves a trio of corrupt detectives (Bill Paxton, Shea Whigham, Mike Epps), Nick’s ex-wife’s alcoholism, a life insurance policy that names Cate as the sole beneficiary, a drug kingpin (Jordi Mollà) out to avenge the death of his son, and plenty of clunky voice-over. None of this gives Term Life an ounce of tension. The movie pootles along with no sense of stakes, as Nick and Cate get some overdue father-daughter bonding time in by going on carnival rides and eating ice cream; every now and then, they have to escape some crudely directed life-or-death situation or other. Crime movies often create artificial realities of their own, but the world of Term Life is as about as fascinating as a flat stretch of suburban highway. Billingsley (Couples Retreat) has a remarkable disregard for anything that might hold viewer interest, though he and Vaughn (who also produced) have managed to put together a heck of an ensemble for something that’s basically a low-tier Nicolas Cage cheapie, minus Nicolas Cage. Whether it’s Taraji P. Henson as the insurance agent who helps Nick fill out his paperwork or Jonathan Banks as a world-weary underworld buddy, Term Life never fails to trot out a familiar face and give them boilerplate dialogue. Despite some concerted efforts—especially on the part of Steinfeld, a talented young actor often given lesser roles, and the always reliable Paxton—this is the kind of material that can’t be elevated without help from behind the camera. Instead, the actors are left to gesture aimlessly through a stupefacient fog of clichés and insipid direction.